Fairleigh Dickinson Univ Pr, 1970-07-01. [1st Amer. ed.]. Hardcover. Used:Good. 2008-07-03. Good. Ships with Tracking Number! INTERNATIONAL WORLDWIDE Shipping available. May not contain Access Codes or Supplements. May be ex-library. Shipping & Handling by region. Buy with confidence, excellent customer service! 1970-06-02. Good. Ships with Tracking Number! INTERNATIONAL WORLDWIDE Shipping available. May not contain Access Codes or Supplements. May be ex-library. Shipping & Handling by region. Buy with confidence, excellent customer service! Fairleigh Dickinson Univ Pr. Hardcover. 0838677088 New Condition. . New. Fairleigh Dickinson Univ Pr. Hardcover. 0838677088 Like New Condition. . Fine. RUTHERFORD: FAIRLEIGH DICKINSON UNIV.. VG/VG. 1970. PREVIOUS OWNER'S NAME AND ADDRESS ON FFEP; SLIGHT STAINING TO A FEW PAGES; . Collins, London, 1968. First Edition. Hardcover (Original Cloth). Very Good Condition/Very Good. Social survey of the British seaman from 1200-1860 by Christopher Lloyd, the late Professor of History, Royal Naval College, Greenwich. This fascinating history includes plates and detail appendix of ships and sailors in period covered. From the Dust Jacket: "There are dozens of books on the great figures in naval history such as Drake and Nelson. By contrast very little has appeared in print about the British seaman, without whom there would have been neither merchant ships to sail, nor men-of-war to command. Apart from vague ideas about the press gang and the mutinies at Spithead and the Nore most people have little conception of what his life was like, even in such important matters as how he was recruited, paid or fed. his courage, his seamanship, his endurance have always been taken for granted." Size: Octavo (standard book size). Text body is clean, and free from previous owner annotation, underlining and highlighting. Binding is tight, covers and spine fully intact. No foxing in this copy. Dust Jacket is in very good condition, without tears or chips or other damage. Dust Jacket price-clipped. All edges clean, neat and free of foxing. Quantity Available: 1. Shipped Weight: Under 1 kilogram. Category: Ships & the Sea; Pictures of this item not already displayed here available upon request. Inventory No: 13758. .
Paladin. Used - Good. Ships from the UK. Former Library book. Shows some signs of wear, and may have some markings on the inside. 100% Money Back Guarantee. Your purchase also supports literacy charities. Rutherford, New Jersey: Fairleigh Dickinson University, 1970. Fine/Near Fine. First American edition. Slight sunning on spin e, still about fine in near fine dustwrapper with a light sticker shadow on the front panel and the slightest toning at the spine. 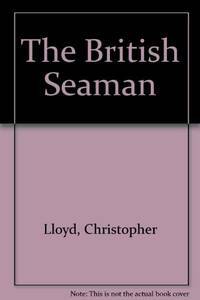 THE BRITISH SEAMAN: 1200-1860 - A Social History. UK,8vo HB+dw/dj,1st edn.FINE/VG.No owner inscrptn,and no price-clip to actual price,though there is a diagonal clip in it's proximity! Bright,clean and crisp,glossy laminated, colour pictorial part-illustrated upper wrap ['Manning the Chains', painting by Atkinson,c1810],with publisher's advert to rear wrap,with a small vertical,diagonal crease to front,inside dw/dj flap,just above the aforementioned price-clip; with negligible shelf-wear and creases to edges.Minimal rubbing+ creasing to corners; head+foot of spine/backstrip minimally bumped with reciprocal creasing and miniscule chipping with reciprocal loss to same.Top+fore-edges generally bright and clean - unusual considering book's age - contents bright,tight and near pristine - no dog-ear reading creases to any pages' corners - an unread copy? Publisher's original clean,blue cloth bds with red title label with bright,crisp, stamped gilt letters to spine/backstrip which is slightly sunned/faded and near immaculate plain white eps.UK,8vo HB+dw/dj,1st edn,8-319pp [paginated] +half-title+title pages,contents+illus lists tables,intro,11 chapters,20 b/w contemporary illustrations throught the text and the book,appendices(3),references,general index,and an index of ships. There are dozens of books on the great figures in naval history such as Drake and Nelson.By contrast very little has appeared in print about the British seaman, without whom there would have been neither merchant ships to sail nor men-of-war to command.Apart from the vague ideas about the press gang and the mutinies at Spithead and the Nore most people have little conception of what his life was like, even in such important matters as how he was recruited or paid or fed.His courage, his seamanship,his endurance have always been taken for granted.It is Professor Lloyd's achievement to have rescued him from anonymity and to have portrayed him in his true colours.A vigorous,quirky,idiosyncratic figure whose vitality could not be quenched by horrible conditions,disgusting food or cruel punishments,he represents at those highest qualities of staunchness and cheerfulness that are claimed,perhaps too glibly,for the national character.From the middle ages to the coming of the steamship,which is the period covered by this book,his circumstances altered little: danger,disease,squalor,arbitary interference with personal freedom and,worst of all,to be cheated of wages that were small enough - these were the rewards of service against the Armada in the time of Elizabeth I,against the Dutch in the time of Charles II,against the French in the time of Napoleon. Why did the seaman put up with all this? Why did not humane and responsible people like Pepys,who knew about these things and were shocked by them,do something about it? How did a country that boasted of its freedom and prided itself on the rule of law square its conscience over such manifest injustice? No-one in future will attempt to answer these questions without availing himself of Professor Lloyd's wide and original research into the problem of manning,the most profound and intractable of all the questions that faced naval administration.Its presentation is as attractive and interesting as its findings are important. Here is a first-rate piece of social history that catches the raciness as well as the pathos of the life it describes. Its characters are individual,glimpsed in the unmistakable tragedies and comedies of real life: Sir James Bagg of the Victualling Office whose nickname Bottomless Bagg tells us all we need to know of his administrative technique: the gunner who, converted to Quakerism,refused to open fire 'lest blood might be spilt': the desperate expedients of seamen,returning home after the long,unhealthy voyages to the tropics,to avoid the pressing cutters waiting in the Channel and the mouth of the Thames.This book illuminates a neglected section of society and the prints with which it is illustrated have the freshness and humanity of the theme. Seller: R. J. A. PAXTON-DENNY. Fairleigh Dickinson Univ Pr, 1970-07. Hardcover. Good. London: Collins, 1968. In tidy condition with a similar price clipped dust jacket. First Edition. Hard Cover. Very Good/Very Good. 8vo - over 7¾" - 9¾" tall. London: Collins, 1968. "This book illuminates a neglected section of society & the prints with which it is illustrated have the freshness & humanity of the theme". etc. HARDCOVER WITH DUST JACKET, 319 pages, the interior/text is clear & in good condition, there is some light yellowing & spotting to the end papers & page edges & the interior has a very mild aged-paper smell. The dust jacket is clean & in good condition, previous bookshop's small sticker is inside the front board, minor shelf wear. Packed securely, prompt dispatch. . Hardcover. Good/Good. 8vo - over 7¾" - 9¾" Tall..
UK: Paladin, 1970. corners creased. edges rubbed. 5mm tear to bottom spine end. owners inscript to half title. pages browning. b/w photo. plates.. First Thus. Mass Market Paperback. Good +. 12mo - over 6¾" - 7¾" tall. Collins, London, 1968.. /Dust Jacket Included. 1968. 1st Edition. Hardcover. 1st edition, hardback, 8vo, 319pp, clean and tight, no inscriptions, Very Good / Very Good dustwrapper (price-clipped) . Fairleigh Dickinson Univ Pr. Used - Good. Former Library book. Shows some signs of wear, and may have some markings on the inside. Fairleigh Dickinson Univ Pr. Used - Very Good. Former Library book. Great condition for a used book! Minimal wear. Collins, 1968. Hardcover. Acceptable. Disclaimer:A readable copy. All pages are intact, and the cover is intact. Pages can include considerable notes-in pen or highlighter-but the notes cannot obscure the text. At ThriftBooks, our motto is: Read More, Spend Less.Dust jacket quality is not guaranteed. London: Collins, 1968. Used hardcover without dust jacket. Book-plate inside front cover. Softened edges and corners of binding, with slight grubbiness on boards. Yellowing at edges of book and page block. Age spotting on the page block. Some fading on the cover and spine. Slightly cocked. MB. hardcover. Good/No Dust Jacket. Used. Fairleigh Dickinson Univ Pr. Hardcover. 0838677088 Good Condition. Has tearing. Five star seller - Buy with confidence! . Good.